How much: Adults £15.00 per night. A reduction for families – £12.50 per adult and £5.00 for each child over three. Fire wood: Available to buy on site. Facilities: Toilets, showers and small washing up area near reception. No hot water for washing up. 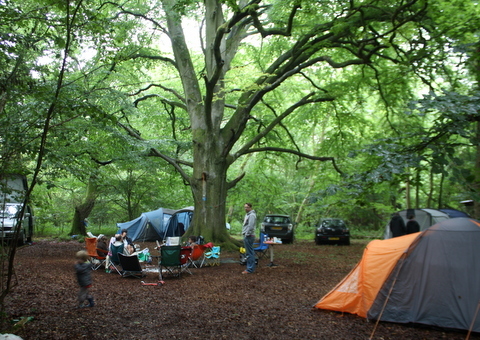 Abbotstone Wood is the latest in the group of campsites managed under the banner of ‘Camping Unplugged‘ including Forgewood in Tunbridge Wells and Inwood near Basingstoke. The camspites share an ethos of giving campers plenty of space, the opportunity to camp in woodland and to experience the wilder side of camping, including campfires. On this occasion we were camping with a large group, this campsite lends itself to large groups as pitches are well spread out, particularly in the woods. We were fortunate to snag ourselves a fantastic large pitch under a huge and magnificent beech tree. 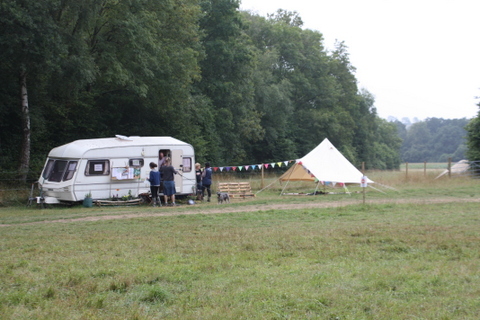 The pitch was easily able to accommodate 3 campervans and 4 good sized tents. Amplified music is not permitted and the vibe is very much family rather than ‘party’. Reception is located in a caravan where the friendly manager stays, so he is nearly always on hand. The main toilet blocks are also here, it was a busy and rainy weekend when we were there and the forest floor tends to get everywhere but the toilets were very well maintained. There are two showers each for men and women and at peak times there was a bit of a queue but with a bit of planning queueing could be avoided and the showers themselves and warm and powerful. Lovely! Dotted around are further portaloos. 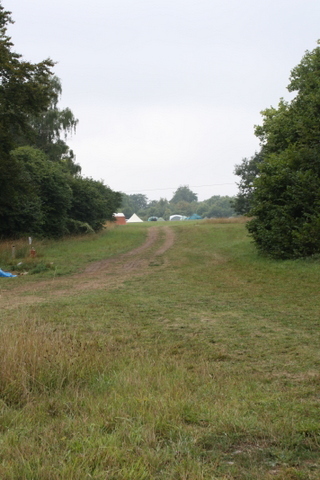 The campsite consists of one very large meadow, another smaller meadow backing onto some woodland and a good number of pitches among the varied deciduous woodland. A couple of ropeswings can be found dotted around the site. There are plans to clear more woodland debris to create further pitches. The meadow is just that, meadow, the grass is not pristine or closely mown. Our beautiful pitch was reached by driving a fairly circuitous route through the trees. Miraculously all three campervans just fitted under the low branches! 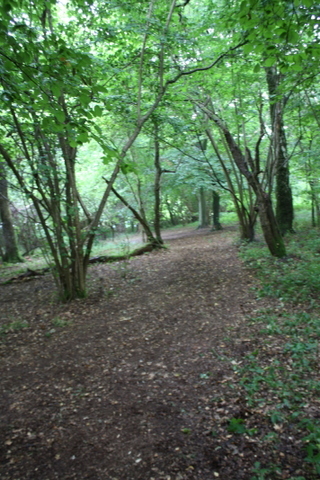 Unlike Inwood, which is so big you can easily spend a few days wandering the campsite woods without needing to leave, Abbotstone wood is smaller (though there is still lots of space). However, it benefits from its proximity to the pretty Georgian town of Arlesford. A ten minute drive or beautiful walk away. Bursting with pretty boutiques, cafes, pubs and eateries plus an idyllic river walk and home to the Heritage Railway Line ‘The Watercress Line‘, Alresford offers more than enough to wile away a good few hours. There is also a good sized Co-op supermarket plus butchers and green grocers. As with the other ‘Unplugged’ campsites John and Nick have succeeded in providing a beautiful site where campers are encouraged to get back to nature, listen to the owls hooting in the woodland, gaze up at the stars and enjoy a warming campfire. These are not the cheapest campsites to stay at and the facilites are basic, you are paying for infinitley preferable ‘space’ and plenty of it. The owners are friendly and I owe them a special thankyou for sorting me out after I foolishly booked the wrong dates! Facilities are basic but well maintained. There is a lot to like about this site. If I had to make an improvement it would be to provide recycling facilities and to enlarge the roof of the washing up shelter as water splashed up the back of my legs as I washed up during a downpour! Such small criticisms are a tribute to this lovely site. A misty approach to the campsite. Perfect Fairy House tree roots. Campsite review: Pleasant Streams Farm, Nr St Austell, Cornwall. In praise of September and the camping gods.